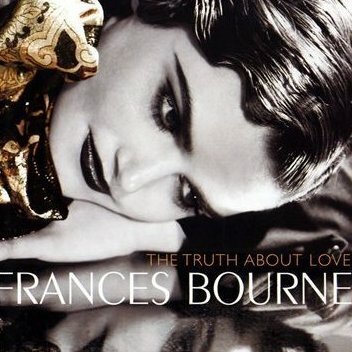 It was Kurt Weill who famously declared that 'music is not bad simply because it is popular' – an observation which would serve well as the motto for mezzo-soprano Frances Bourne's debut CD Tell Me The Truth About Love. The collection sees Weill himself, together with Benjamin Britten and Bohuslav Martinu, amply proving this point in their forays into that most 'popular' of genres – the cabaret song. Britten's ubiquitous Four Cabaret Songs (in a previously unrecorded arrangement by Daryl Runswick) appear alongside songs from Weill's Threepenny Opera, his less well-known Marie Galante, and a rarely heard curiosity from Martinu, the Three Songs for the Red Seven Cabaret. It seems particularly apt that Bourne – a product of classical institutions Trinity College Cambridge and the Royal Academy, and currently shoring up her serious opera credentials for companies such as Opera North – should be the one to present this repertoire, mirroring neatly the framework and experience of the classical composers themselves as she engages with this more popular genre and style. The results are interestingly mixed, but what becomes abundantly clear by the end is that while the works of Martinu and Britten are bringing a cabaret aesthetic to what remains essentially art-song, Weill is doing precisely the opposite – a distinction that accounts both for the disc's undeniable successes and also its failures. Composed initially for cabaret and theatre singer Hedli Anderson, Britten's Four Cabaret Songs have since become a staple of classical mezzo repertoire. While originally scored for voice and piano, the songs have also been performed in recent times in Daryl Runswick's arrangement for cabaret ensemble, involving saxophones, wind, strings, accordion and assorted percussion, an arrangement not recorded until now. In Runswick's hands the music is not only re-scored but – with the exception of the vocal line – also substantially reworked both melodically and harmonically in ways that consciously accentuate the popular and jazz-inspired elements. While the colourful wind interjections during the verse sections of the cycle's opening number 'Tell me the truth about love' work well, the more obvious pieces of word painting such as a doorbell noise to coincide with the line 'Will it knock on the door in the morning,' or a musical quotation from Yankee Doodle at the mention of racing, tip the mood from playful to obvious. In 'Calypso' we find the same tendency towards overstatement, with the undeniable slink and shimmy of the rhythms not quite compensating for the lack of urgency in the refrain 'Driver, drive faster…' or the rather blowsy effect of the embellished harmonies. While these arrangements are undoubtedly fun they will not appeal to the Britten purist, translating as they do the pared-down tongue-in-cheek elegance of the originals into an altogether more raucous affair. Vocally Bourne proves herself more than equal to the technical demands of the songs, but despite the seductive mellowness of her middle and lower registers and the appropriate languor of her delivery we never cease to be aware of this technique at work. Her precision is exemplary, but she fails to capture the humour or lightness of touch achieved in recordings such as Ann Murray's. This is largely owing to her rather literal approach to rhythm, and the additional instrumental forces make it harder for Bourne to risk the kind of expressive rhythmic tug and flow possible with a duo. The Weill songs that make up the bulk of the disc consists of his French-language cabaret numbers, and songs from the authorized French version of the Threepenny Opera – L'Opera de Quat' Sous. Classics such as 'J'attends un navire' and 'Surabaya Johnny' sit alongside the less well-known 'J'ai peur de l'Automne' and 'La complainte de la Seine', and make for a fascinating reminder of the composer's emotional range. The darker side of life is here in evidence in all its forms, from bitter anger to grinning despair, and while Bourne's full tones work well in the more descriptive 'Le Roi d'Aquitaine' and 'Youkali', she never quite seems to commit to the dramatic excess demanded by the more intense first-person songs which even at their most abandoned feel a little polite. There's also a tightness in her upper register that recurs in climactic moments that occasionally distorts the intonation slightly and causes the sound to bulge. Of all the repertoire featured here, Bourne seems most at home in the Martinu. Performed with just piano, these songs feel much more straightforwardly salon in atmosphere, and the three very different moods of the songs gives the cycle the impact of a mini-opera, showcasing Bourne's lyrical range and suiting her technique well. The songs themselves are a revelation – harmonically and texturally adventurous, particularly the middle song 'Bar' – but with such innovation worn lightly and carried along on some shamelessly sumptuous melodies they never make for effortful or academic listening. Composed in 1921 for the notorious Red Seven cabaret in Prague, one might expect even more experimentation and risk, but the focus of the music remains directed toward the sharply observed texts, which explore everyday social situations such as drinking, hardships of labour and marital infidelity. This disc would be worth buying for the Martinu alone, and while Bourne brings little that is greatly original or unique in the more mainstream repertoire there is nevertheless much to enjoy. I look forward to hearing what this young mezzo can produce next, hopefully in a more conventionally classical vein.